You might be wondering why I am baking biscotti at the end of November. Truth be told, I start my holiday baking blintz around this time, and biscotti are always the first cookies to be made, since they keep and freeze really well. As we approach Christmas, I make different kinds of cookies according to how long they keep. I even make a Cookie Calendar, which I adapt from year to year, to keep me organized. (Don’t judge me but yes, I have a cookie calendar 🙂 ). This has been my routine for the past 20 years. A platter of cookies makes for great hostess gifts and Christmas presents… a personalized way of showing someone you care. I’ve come to the conclusion that everyone loves cookies. I’ve never really intended to create a cookie “tradition” or anything like that, but somehow, it’s become a “thing” in my family – everyone now brings a platter of their own cookies to Christmas dinner, and everyone’s eating cookies and talking cookies and swapping cookie recipes! 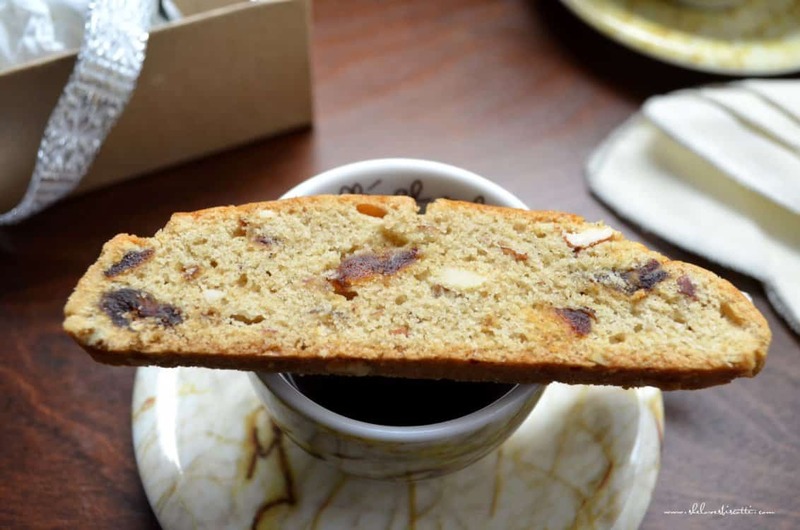 With that being said, today’s spotlight is a recipe for a Simple Almond Date Biscotti that does not require to be baked a second time. Technically, they should not even be called biscotti, since this is a term that refers to something being baked (cotti) twice (bis). If you wanted, you could put them in the oven for a second baking, but I prefer these Simple Almond Date Biscotti without this added step. Biscotti are truly one of my favourite types of cookies. 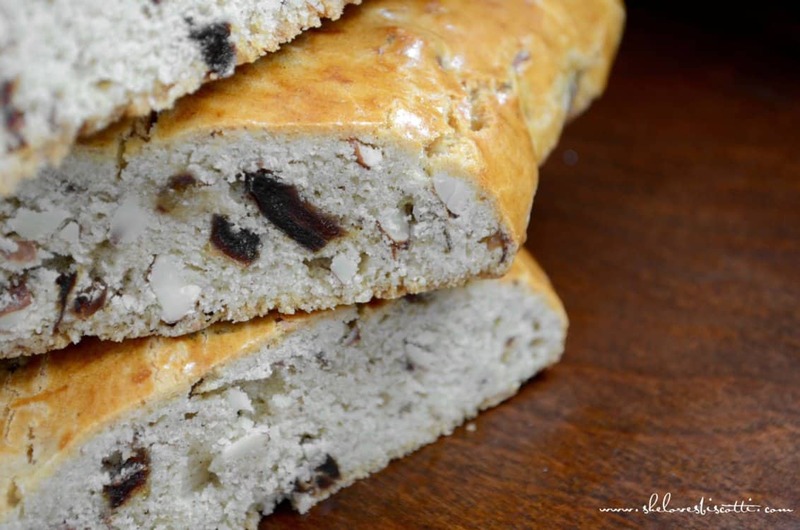 In the past, I have already shared with you a recipe for chocolate hazelnut biscotti, the classic almond biscotti, a super thin crispy almond biscotti and, for those of you that have nut allergies, an Italian anise biscotti. Isn’t it wonderful to have choices! A few years ago, I came across a book called Sweet Maria’s Italian Cookie Tray: A Cookbook. This is a paperback cookbook with no pictures except for some black and white sketched prints. As I glanced through some of the recipes, I immediately recognized the simplicity of her Italian cookie recipes, just like the ones my mom used to make. Sometimes, I feel that there is so much emphasis placed on creating something new, something revolutionary. I think this train of thought can work with some recipes, but with others, I think it’s best to keep things simple. So how could I possibly resist a book with the same philosophy as mine? This paperback book has a whole section on biscotti and that is where I found this recipe. I made minor changes to this recipe: I substituted the walnuts with almonds; and I use a little under 1 cup of both the sugars (the original recipe calls for 1 cup of each). You will notice that a simple brushing with an egg before the loaves are baked will result in a deep golden colored crust. 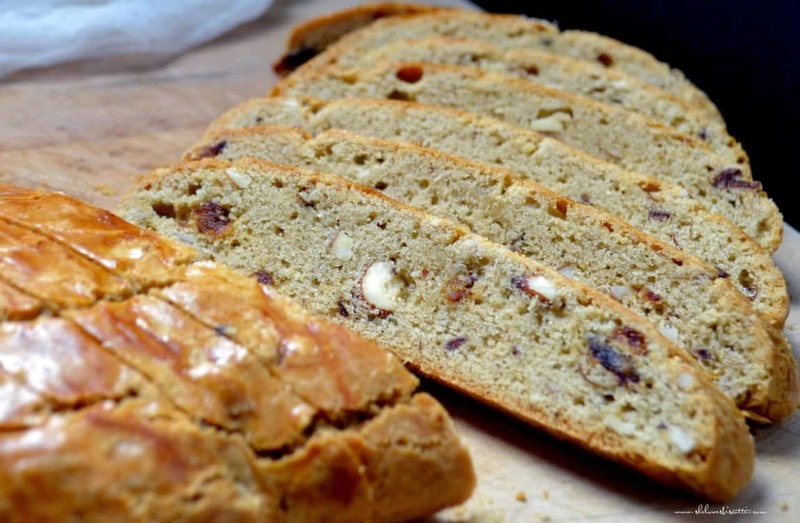 This recipe for Simple Almond Date Biscotti is great even without the second baking. 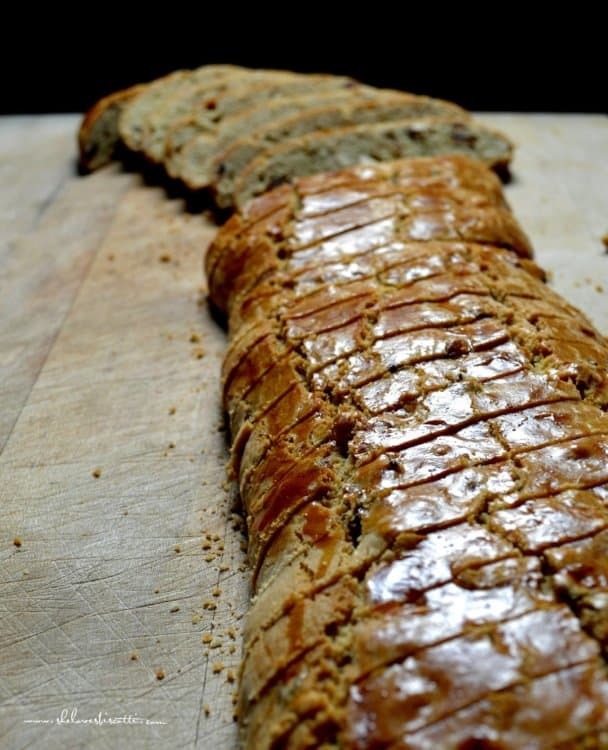 Soft, with the occasional crunch from the almonds, and the natural sweetness of the dates. Truly great to have with a good cup of java or espresso! Enjoy!!! 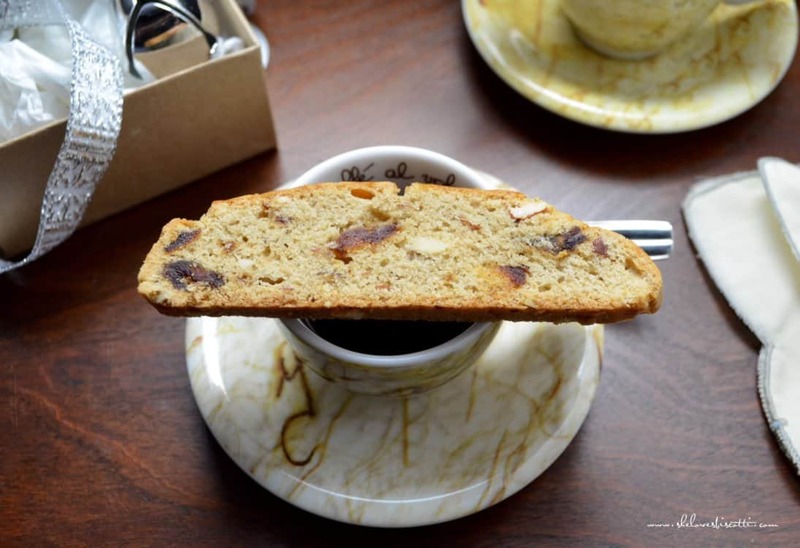 A Simple Almond Date Biscotti recipe which does not require a second baking. Soft, with the occasional crunch from the almonds. Perfect with an espresso! In a large bowl, sift or whisk together the dry ingredients (flour, baking soda, and cinnamon). Add the chopped dates and almonds. Combine well. Set aside. In a medium bowl, whisk eggs. Add oil, and sugars. Whisk lightly together. Add to flour mixture; stir with wooden spoon until well incorporated. 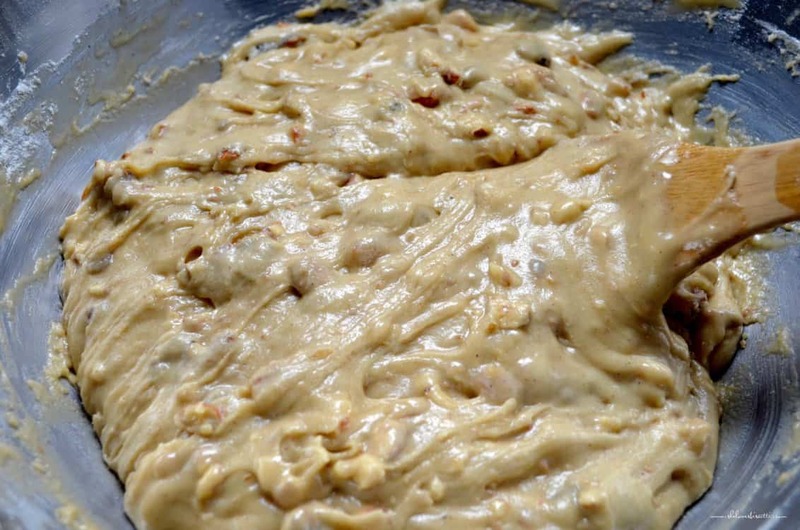 Divide dough into half. Place each half on the cookie sheet, shaping each half into a log. Brush the top of both loaves with the beaten egg. Bake for approximately 25 minutes or until golden brown in colour and firm. Let cool slightly. Cookies can be frozen or stored in an airtight container for up to a week. 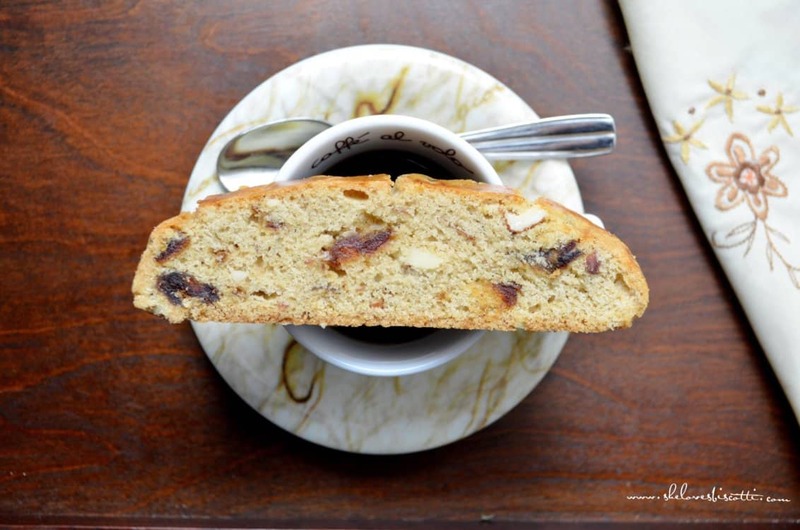 LOVE THIS date biscotti RECIPE? PIN IT TO YOUR BISCOTTI BOARD! Made these for my first time making biscotti! Recipe was easy to follow and mine looked just like the pictures. The cinnamon was a bit stronger than I expected, but I think this will be a lovely flavour for the holidays. Such a warm flavour! I baked my loafs on a ceramic pan, so I had to add about 10 min to the cooking time. And after slicing there was still a fair bit of moisture in the cookies so I did end up doing a short second bake at 3 min per side. They seem like the perfect amount of crunch and chew so far. Excited to full these out of the freezer for Christmas !! Thanks for your recipe. Just made these for my first time baking biscotti’s – very tasty! Few questions: my dough was quite dry before shaping – is there a liquid I could add to make it closer to the consistency of yours? Also mine got quite crumbly when I sliced them, any recommendations for the cutting? Thanks!! I’m really glad you like the biscotti… let’s see if I can help reduce the “crumbly” part. Rather than adding liquid, let’s take a look at the dry ingredients. My first question concerns the flour… Take a look at how you measure your flour… do you fluff and scoop? do you just scoop? do you spoon it into your measuring cup? You might be surprised to learn that all of these methods will yield a different weight and can have an effect on the final product. I will usually fluff and measure. The next variable is the temperature of the oven. Once again, there could be variations from one oven to another. 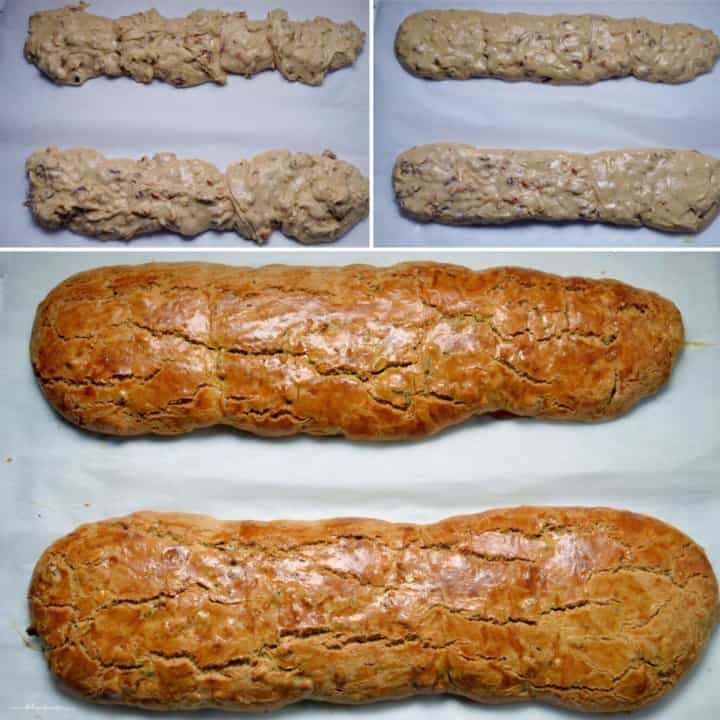 The next time you try the recipe, try taking out the logs a few minutes before the specified time… maybe they were to dry after the initial bake. So I would take a look at them at around 22 minutes and evaluate for firmness in order to confirm that they are done. Worst case scenario, if you take them out and after you slice them you realize that they are slightly under-cooked, pop them back in the oven and they will firm up and become more biscotti like. I like these biscotti because they are equally good with or without the second baking. The only other thing I could think of is the knife used when slicing them. Make sure it is nice and sharp and always use a sawing motion. I absolutely love dates! Can’t wait to try these date biscotti. Thanks for the recipe. Why only week on date/almond biscotti. I normally make with craisins and they are good for 3 weeks in cook room. Just wondering if dates are different. Great question Beverly. I agree… if keeping in a cold room, the temperature resembles that of a refrigerator, so the biscotti can usually keep for a longer period. 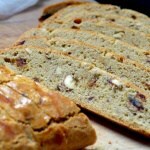 However, it has been my experience that refrigerating biscotti affects the overall texture and taste. I suggest one week at room temperature to be on the safe side because I do not know the environment of the individual making the biscotti. Also, these biscotti do not need a second baking and they contain fruit; as a result, the biscotti will retain some of its’ moisture. As a preference, I suggest freezing this particular biscotti to maintain freshness and quality.